Listeners of the Pandora Internet radio station across multiple Web and device platforms will be hearing fewer ads today. 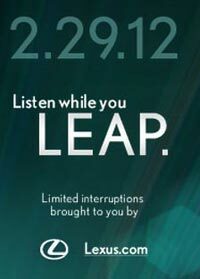 The special Leap Day (Feb. 29) promotion is being sponsored by Lexus. Customers will hear fewer ads throughout the day, regardless of the platform on which they access Pandora: Web smartphone or tablet. The effort is in support of the 2013 Lexus GS. This is the first time a sponsor has underwritten a limited ad experience across the Pandora platforms. The ads that listeners and viewers of banners on the platforms will experience will promote the Lexus GS use of its Enform in-dash information and navigation system. The product is a good fit with the Pandora service, since the Enform platform integrates in-car with smartphones and their streaming media services like Pandora.